North Korean leader Kim Jong-un is being accompanied by nine officials to the inter-Korean summit on Friday morning. Among them are his sister Kim Yo-jong, who also visited South Korea for the Pyeongchang Winter Olympics, and Kim Yong-chol, the chief of the United Front Department. The two were at present when Kim exchanged brief opening remarks with President Moon Jae-in in front of the cameras. Senior apparatchiks include Ri Myong-su, the new army chief, Pak Yong-sik, the minister of People's Armed Forces, Ri Su-yong, vice chairman at the Workers Party Central Committee and Foreign Minister Ri Yong-ho. Cheong Wa Dae Chief of Staff Im Jong-seok, who was in charge of preparing for the summit, said Thursday, "We believe North Korea's top military officials are included because the summit will discuss denuclearization, a permanent peace treaty and the easing of tensions between North and South Korea." Also included on the list of participants are Kim Yong-nam, North Korea’s perpetual titular head of state, and Ri Son-gwon, the chairman of the Committee for the Peaceful Reunification of the Fatherland and counterpart to South Korea's unification minister. Another repeat visitor is Choe Hwi, the head of the national sports body. "The inclusion of Kim Yong-nam, Choe Hwi and Kim Yo-jong despite their lack of a clear role seems aimed at creating a genial atmosphere reminiscent of the Winter Olympics," said Kim Keun-sik at Kyungnam University. Kim Jong-un's right-hand man Choe Ryong-hae is not included, having apparently been left in charge in Pyongyang, though he accompanied Kim on a surprise visit to China last month. 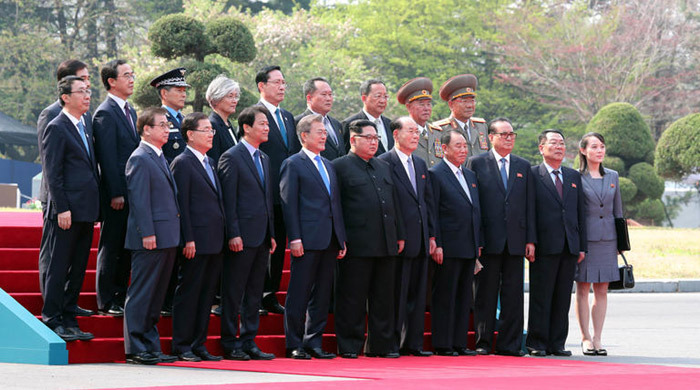 The South Korean participants include the two envoys who arranged the summit, national security adviser Chung Eui-yong and National Intelligence Service chief Suh Hoon, plus Foreign Minister Kang Kyung-wha, Unification Minister Cho Myoung-gyon and Defense Minister Song Young-moo. Joint Chiefs of Staff Chairman Jeong Kyeong-doo was included at the last minute so Ri Myong-su has a counterpart at the meeting. But not all of the officials will sit in the inner sanctum. 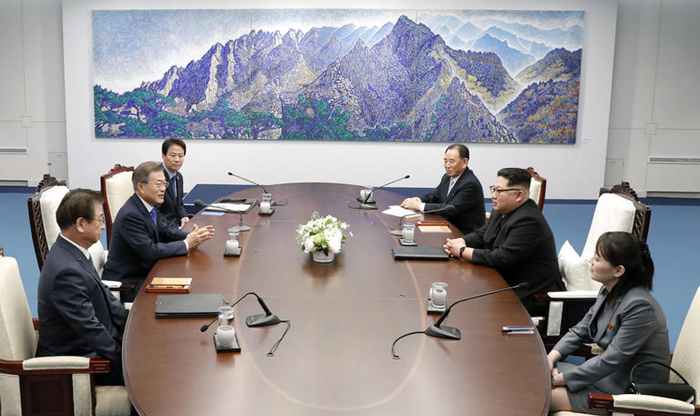 "We originally placed seven chairs on each side of the summit table, but left only five," a Cheong Wa Dae spokesman said.